Purpose: We evaluated the effects of body mass index (BMI) on thermoregulation in obese patients scheduled to undergo laparoscopic abdominal surgery. Methods: Sixty patients scheduled to undergo laparoscopic abdominal surgery with no premedication were included in the study. The patients were classified into 4 groups according to BMI <24.9, 25–39.9, 40–49.9, and >50. Anesthesia was provided with routine techniques. Tympanic and peripheral temperatures were recorded every 5 minutes starting with the induction of anesthesia. The mean skin temperature (MST), mean body temperature (MBT), vasoconstriction time, and vasoconstriction threshold that triggers core warming were calculated with the following formulas: MST = 0.3 (Tchest + Tarm) + 0.2 (Tthigh + Tcalf). MBT was calculated using the equation 0.64Tcore+0.36Tskin, and vasoconstriction was determined by calculating Tforearm-Tfinger. Results: There was no significant difference between the groups in terms of age, gender, duration of operation, and room temperature. Compared to those with BMI <24.9, the tympanic temperature was significantly higher in those with BMI =25–39.9 in the 10th, 15th, 20th, and 50th minutes. In addition, BMI =40–49.9 in the 5th, 10th, 15th, 20th, 25th, 30th, 40th, 45th, 50th, and 55th minutes and BMI >50 in the 5th, 10th, 15th, 20th, 25th, 30th, 50th, and 55th minutes were less than those with BMI <24.9 (P<0.05). There was no significant difference in terms of MST and MBT. Vasoconstriction occurred later, and that vasoconstriction threshold was significantly higher in patients with higher BMIs. Conclusion: Under anesthesia, the core temperature was protected more easily in obese patients as compared to nonobese patients. Therefore, obesity decreases the negative effects of anesthesia on thermoregulation. In obese patients, subcutaneous fat tissue and body surface area increase. Based on its known role in thermogenesis, fat tissue (especially brown fat) may affect the incidence of obesity perioperative hypothermia. For this reason, we evaluated the effects of body mass index (BMI) on thermoregulation in obese patients scheduled to undergo laparoscopic abdominal surgery. After approval of the ethics committee (Firat University Ethics Committee on Non-Invasive Research, 13.01.2015/01/04), trial number (ACTRN12615000375550), and written informed consents from patients were obtained, this study was performed at the Firat University Hospital. Sixty patients scheduled to undergo laparoscopic abdominal surgery with no premedication were included in the study. Patients were chosen from cases that took place between 09:00 and 13:00 hours. Patients with high fever, diabetes mellitus, muscle diseases, hypo/hyperthyroidism, Parkinson’s disease, Raynaud’s phenomenon, and history of drug use that would affect body temperature (β-blockers, calcium channel blockers, clonidine, steroids, antiepileptics, and nonsteroidal anti-inflammatory drugs [NSAIDs], benzodiazepines) were not included. Also, patients who underwent a surgery that took <60 minutes or >180 minutes were not included in the study. Patients whose hemodynamic parameters changed >30% during the surgery, or patients who require vasopressors, vasodilators, or blood transfusions were excluded from the study. The patients were categorized into 4 groups based on their BMI: group I (n=15): BMI <24.9, group II (n=15): BMI =25–39.9, group III (n=15): BMI =40–49.9 (n=15), and group IV: BMI >50 (n=15). The induction (2 mg/kg propofol and 0.6 mg/kg rocuronium) and maintenance (2% sevoflurane in 50% O2 and remifentanil infusion) of anesthesia were achieved with routine methods. Endotracheal intubation was performed for mechanical ventilation at a target end-tidal carbon dioxide value between 35 and 40 mmHg. At the termination of surgery, sevoflurane was stopped, and 100% O2 inhalation was started. Reversal of neuromuscular blockade was achieved with 0.05 mg/kg neostigmine and 0.01 mg/kg of atropine sulfate. Perioperative heartbeat (bpm), mean arterial pressure and tympanic, chest, arm, ½ medial inner face of forearm, ventral face of the distal phalanx of middle finger, thigh, and calf temperatures were recorded every 5 minutes. Waking up from anesthesia was achieved with routine methods, and patients were taken into the recovery room. IBM SPSS (Statistical Package for the Social Sciences) version 20 program was used for statistical analyses. The parametric data were taken as mean ± standard deviation and evaluated with variance analysis, after which independent t-test was used for intergroup comparisons. For intragroup comparison, paired sample t-test was used. The American Society of Anesthesiology (ASA) risk classes of the groups were evaluated with chi-square test. A P-value of <0.05 was deemed statistically significant. There was no significant difference between the groups in terms of age, gender, duration of operation, and room temperature (Table 1). When compared with group I, tympanic temperature was significantly higher in the 10th, 15th, 20th, and 50th minutes in group II; in the 5th, 10th, 15th, 20th, 25th, 30th, 40th, 45th, 50th, and 55th minutes in group III; and in the 5th, 10th, 15th, 20th, 25th, 30th, 50th, and 55th minutes in group IV (P<0.05; Figure 1). There was no significant difference in terms of MST and MBT (Figures 2 and 3). Vasoconstriction occurred later in groups with higher BMIs (in the 10th, 25th, 15th, and 55th minutes, respectively, according to BMI). Vasoconstriction threshold was significantly higher in patients with higher BMIs (35.75°C, 36.06°C, 36.20°C, and 36.20°C, respectively, from groups I to IV). There was no significant difference between the groups in terms of trembling scores, and there was no significant correlation between BMI and trembling. Abbreviations: ASA, American Society of Anesthesiology; M, male; F, female. 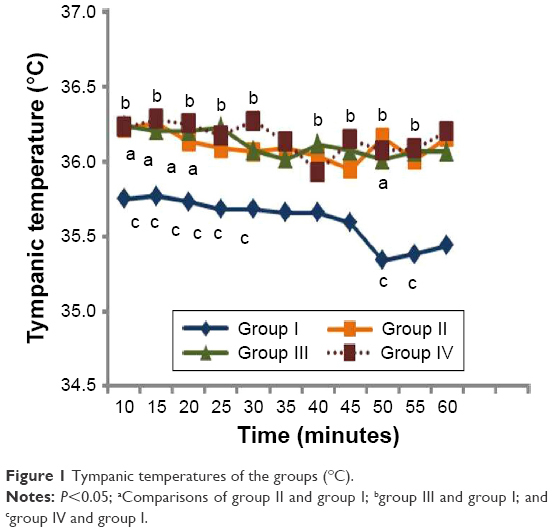 Figure 1 Tympanic temperatures of the groups (°C). Notes: P<0.05; aComparisons of group II and group I; bgroup III and group I; and cgroup IV and group I. 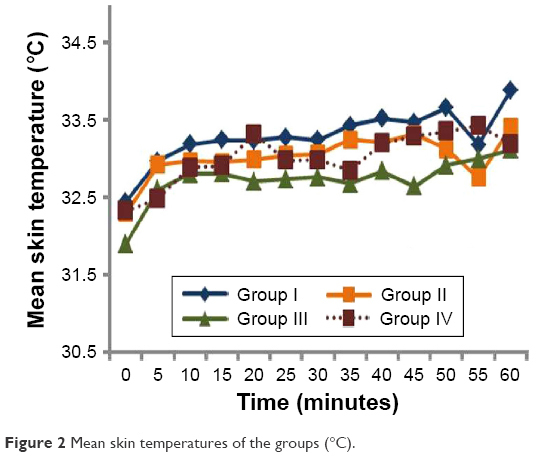 Figure 2 Mean skin temperatures of the groups (°C). 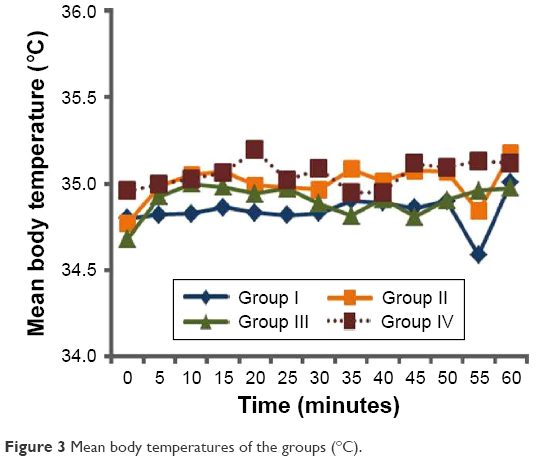 Figure 3 Mean body temperatures of the groups (°C). Anesthesia is one of the practices that tend to create hypothermia by changing the temperature regulation system of the body. Hypothermia development follows a special course during general anesthesia. Core temperature decreases by 1°C–1.5°C during the first hour, and this hypothermia displays a slower and linear decrease during the rest of the time. Consequentially, temperature enters a plateau phase and the core temperature stays the same.2 In this study, we evaluated the effects of anesthesia on thermoregulation in obese patients, and found that tympanic temperature was higher in patients with higher BMIs, while MST and MBT did not change. Interestingly, vasoconstriction occurred later, and that vasoconstriction threshold was higher. Savastano et al studied the relationship between adiposity and regional body temperatures in resting and thermoneutral conditions.13 They compared 13 patients with BMIs between 18–25 and 23 patients with BMIs >30. Using an infrared thermography method, they did not find any difference in the core temperature; however, they showed that abdominal skin temperature was lower and finger bed temperature was higher in obese patients. They declared that the huge abdominal subcutaneous fat tissue in the obese constituted a barrier that prevented heat transfer and protected from normothermia. In this study, we found that core temperature decreased in nonobese patients, and normothermia was better protected during anesthesia, which is known to disrupt thermoneutrality. Obese patients who underwent laparoscopic bariatric surgery under general anesthesia were shown to have better core temperature protection, which was dependent on the degree of obesity. Contrary to all other unwanted effects of obesity in anesthesia practices, it was observed to relieve the negative effects of anesthesia on thermoregulation. This article’s abstract was presented in national congress (48. Turkish Anesthesiology and Reanimation Congress, December 2–6 2015, Antalya, Turkey). Sessler DI. Temperature monitoring. In: Miller RD, editor. Miller Anesthesia. Philadelphia: Churchill Livingstone; 2010:1367–1389. Sessler DI. Perioperative heat balance. Anesthesiology. 2000;92(2):578–596. Steven MF, Kha MT, Lee AF. Clinical importance of body temperature in the surgical patient. J Ther Biol. 2000;25(1–2):151–155. Şahin A, Aypar Ü. Effect of amino acid solutions on intraoperative hypothermia and postoperative shivering. Acta Anaesthesiol Scand. 2002;46(1):64–67. Shanks CA. Mean skin temperature during anaesthesia: an assessment of formulae in the supine surgical patient. Br J Anaesth. 1975;47(8):871–876. Ramanathan NL. A new weighting system for mean surface temperature of the human body. J Appl Physiol. 1964;19:531–533. Burton AC. Human calorimetry: the average temperature of the tissues of the body. J Nutr. 1935;9:261–280. Rubinstein EH, Sessler DI. Skin-surface temperature gradients correlate with fingertip blood flow in humans. Anesthesiology. 1990;73(3):541–545. Sessler DI. Skin-temperature gradients are a validated measure of fingertip perfusion. Eur J Appl Physiol. 2003;89(3–4):401–402. Fernandes LA, Braz LG, Koga FA, et al. Comparison of peri-operative core temperature in obese and non-obese patients. Anaesthesia. 2012;67(12):1364–1369. Kurz A, Sessler DI, Narzt E, Lenhardt R, Lackner F. Morphometric influences on intraoperative core temperature changes. Anesth Analg. 1995;80(3):562–567. Kasai T, Hirose M, Matsukawa T, Takamata A, Tanaka Y. The vasoconstriction threshold is increased in obese patients during general anaesthesia. Acta Anaesthesiol Scand. 2003;47(5):588–592. Savastano DM, Gorbach AM, Eden HS, Brady SM, Reynolds JC, Yanovski JA. Adiposity and human regional body temperature. Am J Clin Nutr. 2009;90(5):1124–1131. Boutet C, Kassir R. Sleeve gastrectomy and roux-en-Y gastric bypass lead to comparable changes in body composition after adjustment for initial body mass index. Obes Surg. 2016;26(8):1932–1933. de Graaf AA, Freidig A, van Ommen B. Human thermoregulation and obesity. FASEB J. 2009;23(Suppl 1):596–602. Caballero A, Arora S, Saouaf R, et al. Microvascular and macrovascular reactivity is reduced in subjects at risk for type 2 diabetes. Diabetes. 1999;48(9):1856–1862.